The subarctic climate (also called subpolar climate, subalpine climate, or boreal climate) is a climate characterised by long, usually very cold winters, and short, cool to mild summers. It is found on large landmasses, away from the moderating effects of an ocean, generally at latitudes from 50° to 70°N poleward of the humid continental climates. These climates represent Köppen climate classification Dfc, Dwc, Dsc, Dfd, Dwd and Dsd. In very small areas at high altitudes around the Mediterranean Basin, Iran, Kyrgyzstan, Tajikistan, Turkey, Alaska and other parts of the northwestern United States (Eastern Washington, Eastern Oregon and Southern Idaho) and Russian South-Eastern regions the climate is classified as Dsc with a dry summer climate, such as in Seneca, Oregon or Atlin, British Columbia. This type of climate offers some of the most extreme seasonal temperature variations found on the planet: in winter, temperatures can drop to below −40 °C (−40 °F) and in summer, the temperature may exceed 30 °C (86 °F). However, the summers are short; no more than three months of the year (but at least one month) must have a 24-hour average temperature of at least 10 °C (50 °F) to fall into this category of climate and the coldest month should average below 0 °C (32 °F) (or −3 °C (27 °F)). Record low temperatures can approach −70 °C (−94 °F). With 5–7 consecutive months where the average temperature is below freezing, all moisture in the soil and subsoil freezes solidly to depths of many feet. Summer warmth is insufficient to thaw more than a few surface feet, so permafrost prevails under most areas not near the southern boundary of this climate zone. Seasonal thaw penetrates from 2 to 14 ft (0.61 to 4.27 m), depending on latitude, aspect, and type of ground. Some northern areas with subarctic climates located near oceans (southern Alaska, the northern fringe of Europe, Sakhalin Oblast and Kamchatka Oblast), have milder winters and no permafrost, and are more suited for farming unless precipitation is excessive. The frost-free season is very short, varying from about 45 to 100 days at most, and a freeze can occur during any month in many areas. Most subarctic climates have very little precipitation, typically no more than 380 mm (15 in) over an entire year. Away from the coasts, precipitation occurs mostly in the warmer months, while in coastal areas with subarctic climates the heaviest precipitation is usually during the autumn months when the relative warmth of sea vis-à-vis land is greatest. Low precipitation, by the standards of more temperate regions with longer summers and warmer winters, is typically sufficient in view of the very low evapotranspiration to allow a water-logged terrain in many areas of subarctic climate and to permit snow cover during winter. A notable exception to this pattern is that subarctic climates occurring at high altitudes in otherwise temperate regions have extremely high precipitation due to orographic lift. Mount Washington, with temperatures typical of a subarctic climate, receives an average rain-equivalent of 101.91 inches (2,588.5 mm) of precipitation per year. Coastal areas of Khabarovsk Krai also have much higher precipitation in summer due to orographic influences (up to 175 millimetres (6.9 in) in July in some areas), whilst the mountainous Kamchatka peninsula and Sakhalin island are even wetter since orographic moisture is not confined to the warmer months and creates large glaciers in Kamchatka. Labrador, in eastern Canada, is similarly wet throughout the year due to the semi-permanent Icelandic Low and can receive up to 1,300 millimetres (51 in) of rainfall equivalent per year, creating a snow cover of up to 1.5 metres (59 in) that does not melt until June. Vegetation in regions with subarctic climates is generally of low diversity, as only hardy species can survive the long winters and make use of the short summers. Trees are mostly limited to conifers, as few broadleaved trees are able to survive the very low temperatures in winter. This type of forest is also known as taiga, a term which is sometimes applied to the climate found therein as well. Even though the diversity may be low, numbers are high, and the taiga (boreal) forest is the largest forest biome on the planet, with most of the forests located in Russia and Canada. The process by which plants become acclimated to cold temperatures is called hardening. Agricultural potential is generally poor, due to the natural infertility of soils[dubious – discuss] and the prevalence of swamps and lakes left by departing ice sheets, and short growing seasons prohibit all but the hardiest of crops. (Despite the short season, the long summer days at such latitudes do permit some agriculture.) In some areas, ice has scoured rock surfaces bare, entirely stripping off the overburden. Elsewhere rock basins have been formed and stream courses dammed, creating countless lakes. The Western Alps between 1,600 and 2,100 meters (5,200 and 6,900 ft), and the Eastern Alps between 1,450 and 1,800 meters (4,760 and 5,910 ft) –France, Switzerland, Germany, Italy and Austria. In some parts of Germany. The Tatra Mountains in Poland and Slovakia, above 800 meters (2,600 ft). The Eastern Anatolia, between 1,600 and 2,100 meters (5,200 and 6,900 ft) – Turkey. The Pyrenees, between 1,600 and 2,100 meters (5,200 and 6,900 ft) – Andorra, France and Spain. The Rocky Mountain Foothills in Alberta and British Columbia. Parts of Ladakh (including Siachen Glacier) and Spiti regions of India. 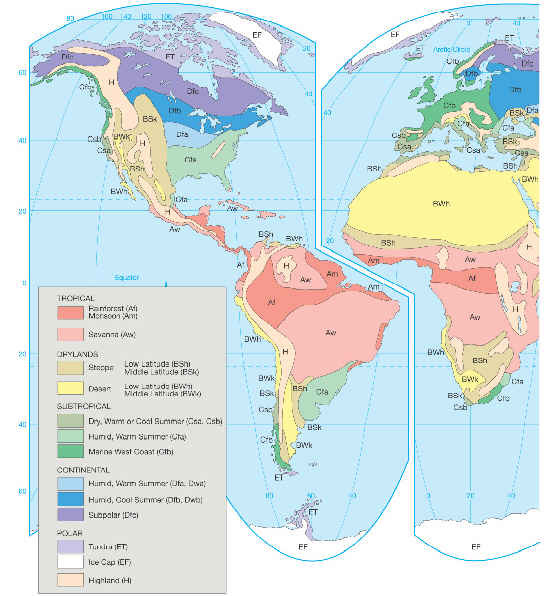 The Southern Hemisphere, which has no large landmasses in the upper-middle latitudes that can have both the short but well-defined summers and severe winters that characterize this climate, has very few locations with this climate. One example is parts of the Snowy Mountains in Australia, although they're more alpine than true subarctic. Should one go poleward or even toward a polar sea, one finds that the warmest month has an average temperature of less than 10 °C (50 °F), and the subarctic climate grades into a tundra climate even less suitable for trees. Equatorward or toward a lower altitude, this climate grades into the humid continental climates with longer summers (and usually less-severe winters); in a few locations close to a temperate sea (as in North Norway and southern Alaska), this climate can grade into a short-summer version of an oceanic climate, the subpolar oceanic climate, as the sea is approached. In China and Mongolia, as one moves southwestwards or towards lower altitudes, temperatures increase but precipitation is so low that the subarctic climate grades into a cold semi-arid climate. ^ Stepanova, N.A. (1958). "On the Lowest Temperatures on Earth" (PDF). Monthly Weather Review. 86 (1): 6. Bibcode:1958MWRv...86....6S. doi:10.1175/1520-0493(1958)086<0006:OTLTOE>2.0.CO;2. Retrieved 4 January 2018. ^ Mount Washington Observatory: Normals, Means, and Extremes, Retrieved July 1, 2009. ^ "Canadian Climate Normals 1971–2000". Environment Canada. Retrieved 2009-10-14. ^ "Moosonee UA Station". Canadian Climate Normals 1971–2000. Environment Canada. 2011-01-19. Retrieved 2012-03-24. ^ "Normwert-Tabellen 1961–1990" (in German, French, and Italian). MeteoSchweiz. Archived from the original on 2009-06-27. Retrieved 2009-10-15. ^ "Luleå, SWE". World Weather Information. Retrieved 2009-10-17. ^ "Nederbörd, normalvärden 1961–90". SMHI. Archived from the original on 2007-10-20. Retrieved 2009-10-17. ^ "Mohe County, 1971-2000". Weather.com.cn. Retrieved 2011-09-12. ^ "Lukla, Nepal Travel Weather Averages (Weatherbase)". Retrieved 2015-08-11. ^ "Crater Lake Nat'l Park H, Oregon Period of Record Climate Summary". Western Regional Climate Center. Retrieved 2012-04-17. ^ "Norilsk Weather Averages and Climate". weather2travel. Retrieved 2012-04-18.